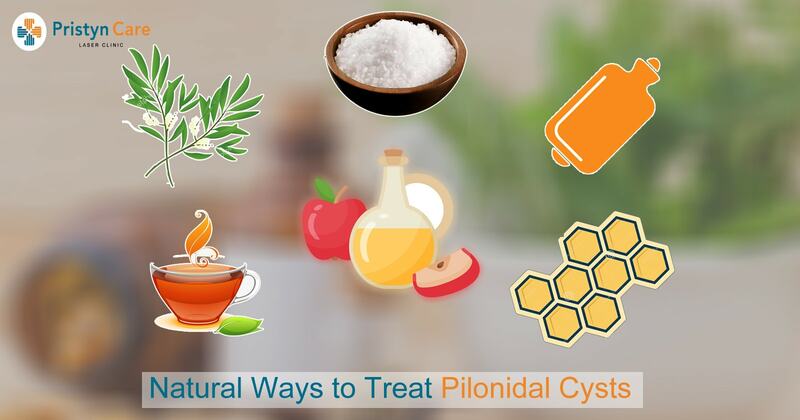 There are numerous ways to treat pilonidal cysts by natural treatments. However, these options may give relief in pain and inflammation only, and may not be helpful in preventing recurrence and other complications. Applying a warm compress on a pilonidal cyst supports blood circulation, which may help in pain and improved recovery. Take a clean towel and heat it on an iron frying pan until it becomes warm. Place the warm towel on top of the pilonidal cyst gently to avoid any injury. You can also use hot water bottles or heating pads instead of an iron pan. Apple cider vinegar is acidic in nature and it can effectively balance the pH level of the affected area and flush out toxins and hence, it reduces the healing time. Take a cotton ball and soak it in some diluted apple cider vinegar. Put the cotton ball on pilonidal cyst for few hours by securing it with a bandage. Tea tree oil holds certain medicinal properties that can speed up the healing process for a pilonidal cyst. Its antibacterial quality also prevents the cyst from any further infection. You should apply this regularly on the pilonidal cyst before going to sleep. Black tea helps in reducing the pain and swelling by its anti-inflammatory properties. Being acidic in nature, it also stops the infection from making progress. Soak a tea bag in warm water for a few minutes, and apply it to the pilonidal cyst for about 15 minutes. Epsom salt on a pilonidal cyst may help and speed up the discharge of pus from the cyst. Take a few cups of Epsom salt to a hot bath and soak your body for about 10 minutes. Beeswax helps to prevent infection and promotes skin cell generation which is needed for pilonidal cyst treatment. Melt some beeswax and apply on the cyst. The curcumin in turmeric may reduce inflammation and relieve pain. Make a paste of a tablespoon of turmeric powder with a few drops of water and apply it on the affected area.